Photo Credit to Anagoria on commons.wikimedia.org. Bust of Cleopatra VII at the Altes Museum in Berlin, Germany. Cleopatra VII Philopator was the last active pharaoh of Egypt before the kingdom fell to and was absorbed by the Roman Empire. 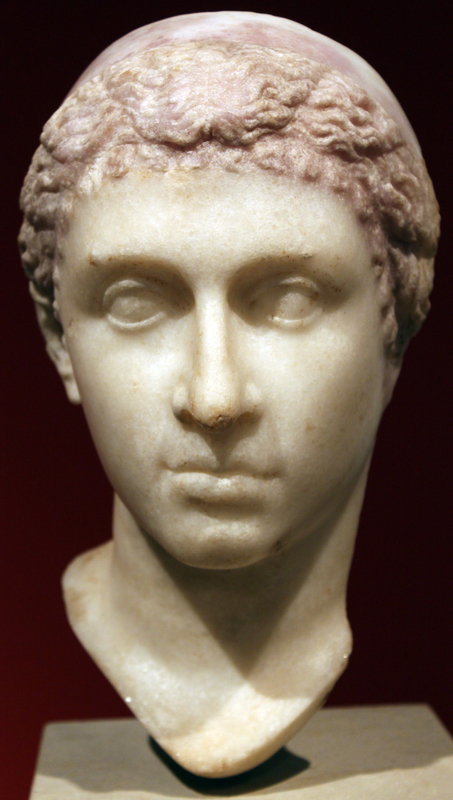 Cleopatra co-ruled Egypt for many years with her father then his different brothers. Eventually she became sole ruler of Egypt. Over the years, Hollywood and popular culture have sensationalized Cleopatra VII’s actions as Egypt’s pharaoh, particularly her relationships with Julius Caesar and Mark Antony. Movies, paintings and plays have kept Cleopatra in the public’s eye even though she died nearly two thousand years ago. For my final project, I chose to create a costume that would be as close to something that Cleopatra would have worn as possible. Of course, being an amateur costume maker at best, my attempt was modest but I believe it hit the mark in many ways, more often than not reflecting what would’ve been a casual, day-to-day outfit rather than a flamboyant and more dramatic ensemble. To begin with, I began searching for pictures of Cleopatra VII. Since her tomb has yet to be found, there are relatively few images of what she truly looked like, but there are busts done in the Roman style and coinage that bear her visage. From theses, I gathered that Cleopatra had naturally curly hair which she kept bound back with a headband and pulled into a bun. To translate this into the costume, I curled my hair naturally stick-straight hair in the smallest sponge curlers available to me. This gave me the naturally curly hair look that Cleopatra would’ve enjoyed when she wasn’t wearing a wig or other headdress. Photo Credit to Olaf Tausch on commons.wikimedia.org. Etching of Cleopatra VII and her son Caesarion on the temple at Dendera. Ancient Egypt was known for their elaborate eye makeup. I copied this from papyrus drawings, wearing blue eye shadow and using eyeliner as kohl. I chose to sport an eye of Ra in addition to the thick black eyeliner and blue eye shadow for dramatic effect. 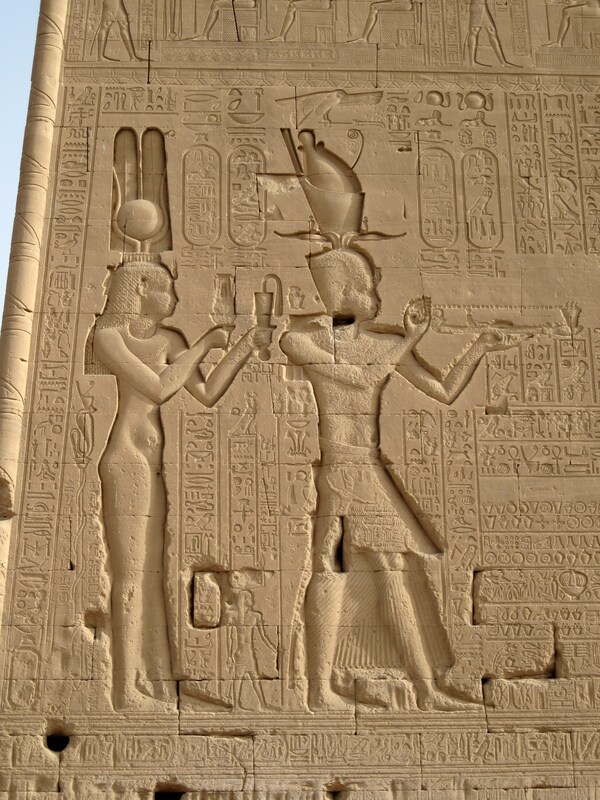 The etching of Cleopatra VII and her son Caesarion on the temple at Dendera show Cleopatra sporting a collar-style necklace and a headdress similar to the one worn by the goddess Isis. The etching has no color, so I used papyrus paintings and jewelry found in ancient Egyptian tombs to determine that semiprecious stones like feldspar, carnelian, jasper, turquoise, jade and lapis lazuli were most likely used in jewelry that Cleopatra would have worn. Since I’m no master jewelry maker, I created a collar out of crepe-back satin using felt as an interfacing to give the collar some body and attached plastic jewels to it using fabric adhesive. I used red, shades of blue, and yellow colored stones. Respectively, these stones for Cleopatra would have been jasper or carnelian, lapis lazuli and turquoise, and feldspar or topaz. Photo by Abby Payne. Detail of Eye of Ra eye makeup. Moving caudally, the shift that Cleopatra would have worn would most likely have been made of a fine linen. In ancient Egyptian papyri, statues, and wall etchings, one can see that both men and women wore simple white clothes that required little to no sewing, just a wrapping of fabric around the body held in place by pins, belts, robes or collars. For my costume, I chose to create the dress of white linen, wrapped around my body several times to ensure modesty. I pinned the fabric to an undershirt at my shoulders to aid in keeping the dress in place. While many ancient Egyptians weren’t terribly worried about keeping their bits and pieces covered, I am. For my linen shift, I chose to take inspiration from ancient Rome as well, considering that Egypt would have been well acquainted with Roman fashion during Cleopatra’s time as Pharaoh of Egypt. Instead of simply pinning the shift shut, I threw the end the length of fabric over my shoulder and pinned it to my undershirt. This gave an interesting Roman flair to an otherwise distinctly Egyptian costume. Photo by Kraig Peterson. Finished historically accurate Cleopatra VII costume. At my waist, I wore a belt made of crepe-back satin and felt. The belt wrapped around my natural waist with a section hanging down in front. The belt is decorated with yellow, blue, and green jewels, respectively those jewels would be feldspar, lapis lazuli, and jade. In reality, Cleopatra’s belt would have been made of gold and contained real jewels. In ancient Egypt, there wasn’t a real need to wear shoes in order to stay warm, so unless the ground was dangerous, normal people wouldn’t have worn shoes. However, Cleopatra would’ve worn sandals made of leather and reeds decorated with jewels. For this costume, I wore a pair of sandals that have an ankle strap attached to the soul of the shoe with one band going from the ankle strap between my toes. The finished product was almost exactly as I had in mind. The shape of the collar was a little off, and my hair didn’t exactly what to cooperate, but it all worked out pretty well. In the future, if I do this particular costume again, I think I will invest in some eyeliner in a pot instead of using the felt-tip wand eyeliner I use everyday. Also, I think the collar was a bit tight and I would’ve preferred the shape to be a bit more round and little less rectangular. But, c’est la vie, non? At any rate, I’m pleased with the way that this costume turned out. Anagoria, Portrait of Cleopatra VII; Marble; Inv. 1976.10, http://commons.wikimedia.org/wiki/File:-0035_Altes_Museum_Portrait_Kleopatra_VII_anagoria.JPG, 24 April 2014.